And, in a flash, that was that. 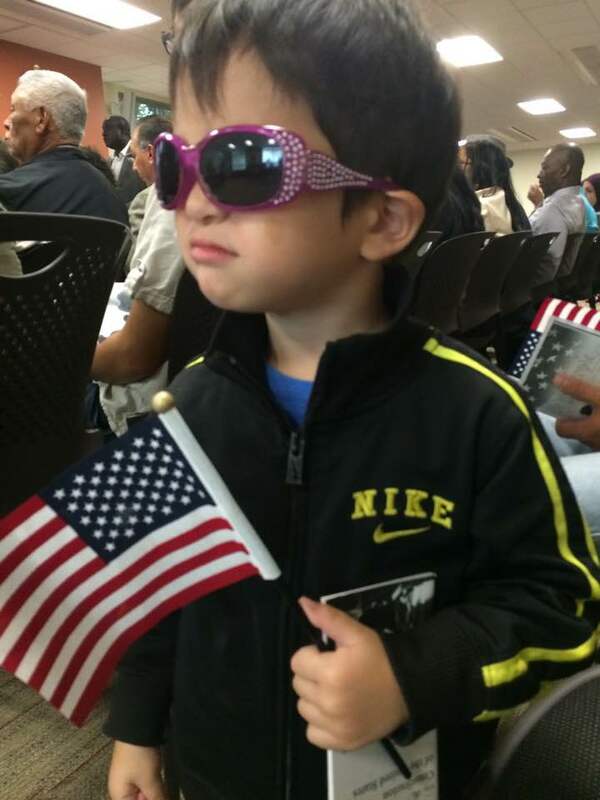 With the pledge of allegiance and the gift of a small American flag, Ya-Jhu was officially an American. This was the end of a 10-year process, during which she had visas and green cards galore. Every time she had to re-enter the country over the years, she panicked at the thought of possibly being separated from husband Sheridan, three year old Aiden and baby Peter, US-born citizens all. Studying for her citizenship test at the dinner table, we all learned more than we’d ever known before about our history and our system of government. Yaj aced every question we asked her. She brought Aiden downtown for the ceremony as the rest of us were working, and she truly didn’t want to make a huge deal of this. But I know she was happy to bring this chapter of her life to a conclusion, and begin the next. But here’s the thing: Ya-Jhu opted for dual citizenship (USA and her native Taiwan). She deeply loves her homeland and wanted to retain her citizenship there as well. So she is, truly, a citizen of the world. In this distressing time of rabid nationalism, I find it both refreshing and encouraging that there are so many Ya-Jhus out there who belong to two nations, both paying tribute to the land of their birth, and joyfully joining the ranks of their country of residence. Because what are borders but the lines arbitrarily drawn by the powers that be? Look at Germany, Italy, Russia, much of Africa—areas were named and renamed, claimed and reclaimed. It seems to me so foolish that people vilify the citizens of other countries, and deny their refugees entrance in a time of war and hardship. What, I ask them, would have become of THEIR ancestors when they came to the United States, had they been summarily turned away? And I recall with shame the way we brutally took over this country, that our Native brothers and sisters had lived in for thousands of years. We have a lot to face, guys. How I wish we could all be just international citizens! It is a big, beautiful, amazing world, and I feel so sad that artificial barriers keep us apart. When you think of it, we are each a melting pot unto ourselves, a wide variety of ethnic backgrounds. Whether we claim dual citizenship or not, we all have roots in other countries. So as we officially welcome Ya-Jhu Yang, American, into our midst, let us salute Ya-Jhu Yang of Taipei, Taiwan. Let us love our country without elevating it to sainthood. Let us wave our American flags, as well as the flags of all nations. I look at the picture Yaj snapped of my darling grandson Aiden at the ceremony, Aiden who is half American, half Taiwanese. He is the precious product of two distinct and wonderful cultures, now merging with his amazing mother, and I wouldn’t have it any other way.